Epoxy is one of the easiest and cheapest ways to transform your garage floor into a thing of durable beauty. 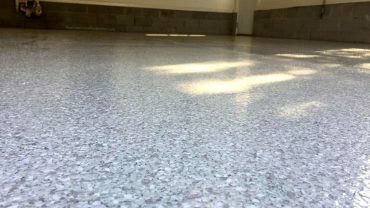 Rust-Oleum is undoubtedly the biggest brand name when it comes to epoxy floor coatings. Their products are known for their superb durability, their stunning beauty, and their unbeatable value for money. Today we are going to look at one of their most popular products in our Rust-Oleum ExpoxySheild 261845 review. When it comes to looking good, there are very few products on the market that can compete with this stunning epoxy. It’s a classic medium gray color which on its own is reasonably uninteresting. However, this provides the perfect canvas for the stars of the show – the metallic flakes. No one does metallic flakes like Rust-Oleum. They are known for finding the perfect color balance between their epoxy and their flakes (in all of their products). When it’s all put together you get a stunning, highly designed combination that looks like it cost a lot more money than it actually did. If you don’t want something too over the top and outlandish, but want a little bit of “jazz” in your flooring. This could be the product you have been waiting for. However, the product includes enough metallic flakes to make your flooring quite an eye catching showstopper if you wish. But as the flakes are not pre mixed into the epoxy you can sprinkle them to your specific tastes. This epoxy looks so good you’re going to be scared to drive your car on to it, (But you shouldn’t be). Just because this epoxy looks like it’s a work of art hand created by a professional designer doesn’t mean it’s not super tough. This is an epoxy that will stand the test of time and take everything you can throw at it without a care in the world. Hot Tire pickup is one of the biggest problems with most garage epoxy floors, it’s a big issue that lower quality brands choose to ignore. Hot tire pick up is so serious that it can drastically reduce the beauty (and the life span) of your flooring within a few months of heavy usage. However, this product has been engineered to be highly resistant to hot tire pick up, and your floor will laugh in the face of your car as it drives over it. This epoxy is also super resilient and will outperform most other products on the market in terms of cracking and peeling over time. 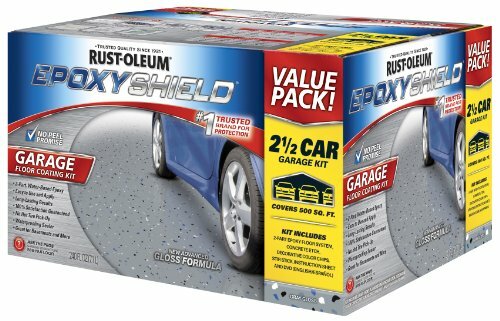 As you would expect from a Rust-Oleum product it’s also resistant to oil, gasoline, antifreeze, salt, and other chemical spills that are common occurrences in garages. The kit includes everything you need to get started on your floor once it has been prepared for use. A single kit can cover up to 500 square feet which is almost enough for a 3 car garage. Application is easy and seamless, and once finished you will be able to walk on your new flooring within 24 hours, and you will be able to drive on it within 72 hours. This is a great product that is going to do you proud. If you are looking for something that looks great and can put up a fight against the rigours of garage life – then this is almost a no brainer. We highly recommend it, and it’s more than worthy of your consideration.